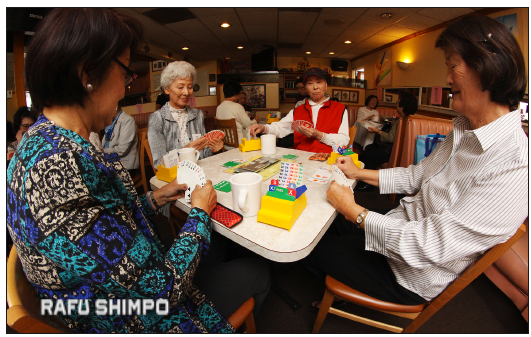 There were 15 ladies — one short — at the meeting of the Angels Bridge Club at Cherrystones in Gardena. “Do you want to play?” one of the players asked me, sweetly. I had to decline. In bridge as in life, there are instances where a really terrible player might just be worse than no player at all. Unfortunately, I am no bridge player, although I used to play card games with my cousins when we were kids on summer vacation: games like gin, war, Crazy Eights, bulls***, and the ever-popular 52-card pick up. It always seemed like someone was gonna cry, throw a fit, or get punched somewhere during the course of our games. Bridge is not a kids’ game. Played with four players in two partnerships, bridge requires strategy, skill, intelligence and good communication skills with your partner. Fun, social and mentally challenging describe the duplicate bridge group that regularly meets at Cherrystones. The Angels members are about half Japanese Americans and half Japanese. To outsiders, Japanese and Japanese Americans may all look the same, but the cultural-social differences can be profound, so any group that brings Js and JAs together in friendship is most welcome. On the day I attended, the Angels were one player short for one of their foursomes, so ladies rotated in and out of the games, enjoying one other’s company and the ample supply of munchies. The organizer of these gatherings is Chris Uriu, my stepmom, who has been playing bridge for more than 30 years and has led the group since 2000. Chris grew up in the Senshin neighborhood, attended UCLA, and taught at Narbonne High School in Harbor City. I’ve been so lucky to have Chris in my life and, it seems, so have these bridge players. The members number about 25 and come from as far away as Santa Monica, Glendale, Orange County and Hacienda Heights. A typical day of bridge will last about three hours, with a break for lunch. Jean Futami takes the score sheets home and tallies the scores for all the players. A small kitty is distributed among the winners. Bridge brings the Angels together and over cards they share stories about the latest news, restaurants, TV shows (Korean dramas?) and goings-on in their lives. I asked some of the ladies why they play bridge. Futami said that bridge is enjoyable because you can always get better. Margaret Mataga said bridge is a way to stay active and sociable. Anna Mae Tamaki, mother of JT Tamaki, actor/community volunteer/all-around good guy, had maybe the best answer when she simply exclaimed, “I love bridge!” before returning to her game. Sounds good and thanks for letting me drop in, Angels! I find myself forgetting things lately, names and words that seem to be just beyond reach of this middle-aged brain. A challenging game like bridge might be the trick to keeping the ol’ memory sharp. Grab your kachi kachi because this coming weekend will be a remarkably busy one for the JA community, particularly if you love grilled chicken teriyaki, Okinawan dangos and bon dancing. By some quirk with the calendar, many of the community centers and temples are holding their big festivals on June 27-28. San Fernando, Senshin and West Covina will all be holding their Obon festivals this weekend. On top of that, Gardena Valley JCI, Long Beach Japanese Cultural Center and Venice Japanese Community Center will be staging their annual summer festivals. These are important events for each center, and I imagine that the Fourth of July holiday landing on a Saturday meant that many festivals had to be moved. I just wish it would be possible to space them out a little bit so that more folks from other parts of SoCal could visit each festival. In Japan there is a popular activity for kids called the stamp rally. At every train station or tourist attraction there will be rubber stamps with unique images. I used to always stamp my sketchbook whenever I saw one, it’s a fun way to remember where you’ve been. I believe in some cases, if you collect all the stamps you receive a small prize. I think a JA community stamp rally would be a fun way to encourage JAs to venture outside of their own communities and explore the other centers of JA life here in L.A. In addition, the JACCC will be holding their annual gala dinner on June 27 in Long Beach and they will again be recognizing some terrific folks with their Community Spirit Award. This year, Ron Dyo, Patty Ito Nagano and Glenn Tanaka are being honored. I feel fortunate to say I know all of the awardees, though I may not know the particulars of why they’re being singled out. One thing that is true of all three is that whenever you see them, they’re usually busy doing something for others. Ron Dyo is active with the Pasadena Japanese Cultural Institute and Rising Stars Youth Leadership. An avid fisherman, Ron rounded up sponsors and started the Kids Gone Fishing event last year to give city kids a chance to experience catching their own trout. Ron and Cindy Dyo are also super Bruin alumni who put together some amazing tailgate parties and are known to even invite some friends from that other school on the day of the big game. I think J-Town became a greater neighborhood the day Patty and Steve Nagano decided to make it their home. Since they moved to Little Tokyo, Patty has become an active volunteer with the Little Tokyo Historical Society, Sustainable Little Tokyo and JACCC. She’s also busy working on a reunion of Cal State Long Beach Asian American Studies alumni and a dance benefit for the Budokan. I’m glad that Patty has time for Zumba at Higashi on Friday nights. It’s always fun to work up a sweat with the Zumba ladies. Glenn Tanaka has a deep tan that speaks to his hard work down on Tanaka Farms in Irvine, but he always seems to have time for the community. This includes being a great sport as he modeled sportswear for the So-Phis fashion show in April. Glenn’s “Walk the Farm” fundraiser, now in its fifth year, raises money and awareness for Tohoku farmers still struggling after the 2011 earthquake and tsunami. It’s a fun, educational and tasty event I look forward to every year. It’s with some sadness that I think about the Community Spirit awards. Nancy Kikuchi, who passed away last September, was one of the recipients last year. I was among the group who wrote testimonials for Nancy. We all knew that Nancy was in the fight of her life and all of us wanted to do whatever we could to show her our love. The JACCC dinner was also Nancy’s chance to show how much she loved this Japanese American community: it was her heart and soul. In a similar vein, I never met Yoshie Hirata, a 2015 Women of the Year honoree, but I was shocked and saddened to hear of her recent passing, so soon after the awards luncheon. 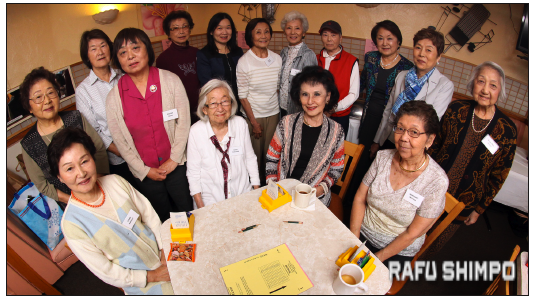 It is wonderful that the Downtown JACL and Japanese Women’s Society of Southern California recognized her vital work at Keiro and Pioneer Center and that Yoshie had the chance to receive the well-deserved praise. Life is short. It’s important to recognize people who are doing great work now rather than waiting until it’s too late.